Flavor Text: It shuddered, slithered, and flowed through the tunnel. Teeth without mouths and far too many eyes. An impossibility of terror made flesh. 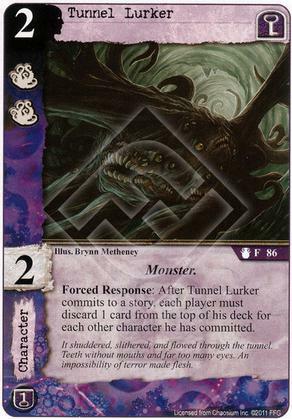 Does Tunnel Lurker also count as a commited character for the discard effect, i. e. does the owner of Tunnel Lurker has to discard when it is his only commited character? No, because it says "for each OTHER character". So everybody except the Tunner Lurker. I believe normal (framework action) Story commits generally happen all at once, not in sequence. A Forced Response that triggers after an event (most do) are higher priority than responses, but otherwise quite similar. So it would happen after resolving the framework action of committing everyone that you chose to commit.